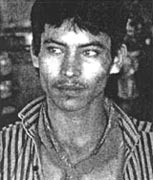 MARTÍN Pérez, since he was 10 years old, lived on the streets in Culiacan, the capital city of the state of Sinaloa, Mexico. He survived by stealing, doing odd jobs, and trafficking drugs. 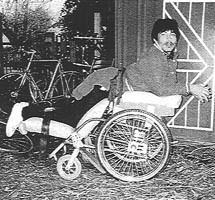 At age 15, as a result of a gang dispute, he was shot through the spine and became paraplegic (paralyzed from the middle of the back down). Upon his release from the hospital, he was sent to PROJIMO. On his arrival, Martín was near death from a urinary infection and pressure sores that had developed in the hospital. He was angry and depressed, but had the will and spirit of a survivor. As is usual in PROJIMO, other spinal-cord injured persons took over the management of Martín's urinary problem and pressure sores. 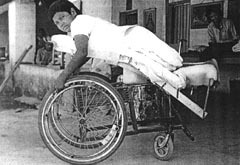 In the wheelchair shop, they built a wheeled cot, or gurney, so that he could be active while lying on his stomach, and so his sores (on his backside) would heal. Frozen hips. Martín recovered his health, and his sores healed in record time. But a new problem was developing. His hip joints were beginning to ossify - in other words, the flesh around the hip joints was beginning to turn into bone. This problem, called myositis ossificans, occurs occasionally in spinal-cord injured persons. It happened to Jaime, a worker in PROJIMO's wheelchair shop. 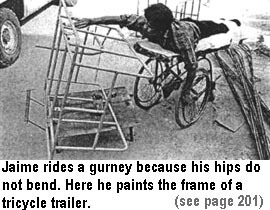 Because his hips are solidly fused into a straight position, Jaime works while lying on a gurney (see photos on pages 195, 200 and 247). There is a debate among specialists as to what to do when myositis ossificans starts to develop. Some recommend very limited motion of the hips, in the belief that movement causes irritation and speeds the deposit of bone. Others argue in favor of aggressive range-of-motion exercises, to try to stop the joints from freezing up. Martín learned that Jaime had not exercised during the time when his hips became ossified. Therefore - at a stage when Martín's hips had almost no movement left - he set about exercising to bring back flexibility. Every morning his hips were so stiff he could barely move them. But he would diligently exercise for an hour or more to recover lost range of motion. With his persistent exercise program, Martín managed, in time, to regain complete range of motion of his hips. Nevertheless, every morning his hips would partially "freeze up." For years, he had to keep up his morning exercise routine to maintain flexibility. On the positive side, Martín developed into an extremely innovative and creative wheelchair builder. He solved design problems in the Whirlwind wheelchair that disability engineer Ralf Hotchkiss had struggled with for years (such as a very simple mechanism to adjust the angle of the footrests). Ralf was so impressed with Martín's abilities that he invited him to live in his home and to work in his shop for a number of months. Martín even became a teaching assistant in Ralf's course in rehabilitation design and engineering at San Francisco State University, in California. Also on the positive side, Martín was very friendly and helpful to some of the neediest disabled children at PROJIMO. Whenever they needed help with their aids or equipment, they went to Martín, who would always help them in a warm, personal, and effective way. 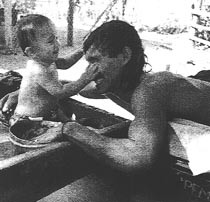 Martín was sometimes too active and hard working for his own good. He had begun to use a wheelchair before the last pressure sore on his backside had healed. As a result, the sore - although it had healed except for a small opening on the surface - had formed a large and stubborn cavity underneath. Periodically this cavity became infected. Surgeons from Interplast (International Plastic Surgery) who examined Martín decided he needed surgery to repair the deep sore. They offered to do the operation free of charge, in Stanford, California. Martín's biggest worry was the post-operative period. The surgeons told him he would need to lie on a special "air bed" for 6 weeks, to allow healing. But Martín - who knows his own body well - feared his hips would freeze up forever if he lay flat for so long and could not do his daily bending exercises. In order to maintain flexibility, he felt that during the post-surgery period he needed to be positioned at different and changing hip angles. He told the surgeons he could make a jointed gurney with adjustable hip and knee angles to use post-operatively. But the surgeons were skeptical. The surgeons doubted that Martín could make a satisfactory gurney. And if he did, they doubted that he would be able to lie on it face down all day long. But Martín was persistent. The doctors decided to test him. They insisted that he spend three days and nights continuously on the gurney, to prove that he could do it without complications. Martín did this successfully, and the doctors at last agreed to let him use the gurney following surgery, instead of being on the special hospital bed. 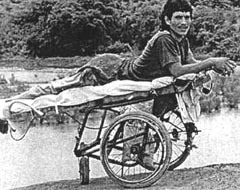 The flexible gurney that Martín made for his post-surgical recovery period was built on top of a standard donated wheelchair. The hip and knee angles could be easily adjusted by hand. He upholstered each section of the gurney with water-resistant vinyl (plastic cloth). The above photos show Martín trying out his new gurney, and the gurney alone in 3 of the many different positions to which it can be adjusted. Other jointed gurneys have been custom-built at PROJIMO and used by persons with a variety of needs. Here is a gurney for a boy, DANIEL, who is paraplegic due to tuberculosis of his spine. When Daniel came to PROJIMO, his body, hips and knees were contracted in a sitting position, and he had severe pressure sores. Therefore, the team built for him an adjustable, jointed gurney that could gradually straighten him out. In contrast, the next chapter describes a jointed gurney that was built for a boy (Osvaldo) to gradually bend his hips and knees, which had stiffened in an extended (straight) position. 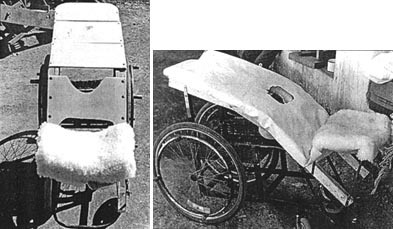 Additional information on designs for wheeled cots or gurneys can be found in the book, Disabled Village Children. Also see the next chapter, pages 246-248.